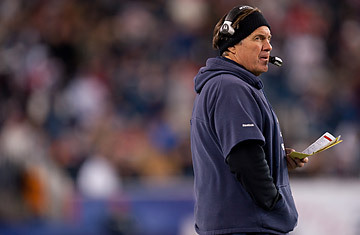 New England Patriots head coach Bill Belichick looks at a play book during the game against the Indianapolis Colts at Gillette Stadium on November 21, 2010 in Foxboro, Massachusetts. NFL analogies get tossed around all the time in the education world. And they get fumbled too. The most recent example: In December Randi Weingarten, president of the American Federation of Teachers, was talking about giving teachers feedback about their performance when she said, "Football teams do this all the time. They look at the tape after every game. Sometimes they do it during the game." Not exactly. It's against NFL rules to use video during a game. But Weingarten was onto something important: "They're constantly deconstructing what is working and what isn't working," she said of pro teams. The heavy use of data and performance evaluations is indeed key to success in the NFL. But unfortunately, very few schools are good at this kind of thing. For a deeper look at what educators might be able to learn from pro football, I talked with Tim Daly, a leading education reformer and president of the New Teacher Project, which trains teachers and conducts research and policy analysis, and his brother Brendan Daly, a former teacher who coaches the defensive line for the St. Louis Rams. TIME: Let's start with Weingarten's statement about the use of tape. Is she right? How intensive is evaluation in the NFL? Brendan Daly: She's right in general, but it's against the rules to use tape in the game. Instead, photographs are used. There are four photographs of each play taken from the sidelines and end zones, pre-snap and post-snap. With the photos you're trying to see your alignments, what mistakes you've made and corrections you can make. I look for the tendencies of the offense and what they're doing to us. [The set of photos] confirms if they're doing what you thought or doing something differently. The video you've watched all through the week leading up to the game gives you the foundation to make those decisions during the game. During the game, the photos come in a book, and when I'm done looking at the book, the players ask to see it as well. We evaluate everything. When we start training camp, we watch every practice with the players, and at the end of the day, we give a numeric grade to each player, so two practices a day means two grades. During the regular season, we don't grade practice but grade every play of every game. We grade on technique, and we grade on production. Players have each other's grades in front of them as we go through this. Tim Daly: In schools it's almost the opposite. [Video] is almost never used for making adjustments in the near term. There are not many conversations in general between administrators and teachers about what's happening in the classroom and how to adjust quickly. When we did the "Widget Effect" [report in 2009], we found that most teachers got zero, one, or two periods of observation over the year. In some districts, we found that veterans were not even observed every year. It's not a priority in policy, and many collective bargaining agreements limit evaluation. Conversely, in high-performing schools we see that administrators and other teachers are frequent visitors to classrooms. Instead of zero, one or two [observations], it's 30 to 40 per year in those schools. TIME: What about feedback? Any differences in how it is received? Tim Daly: In education, we've conditioned people to see feedback as a negative. In the NFL, they welcome it. Brendan Daly: Jobs are hard to come by, so players are extremely motivated to do whatever it takes to keep their job. There is a lot of transparency about performance at this level. More often than not, you find players seeing something that they can help another player with or reinforce something the coaches are seeing. Veterans do that regularly with younger players. My line understands that there is a need for all of them to get better, collectively, and they are accountable to each other because it's a team and must collaborate with each other to get better. When teams win and play well, everyone benefits from a financial standpoint. But everyone takes pride in people being able to achieve at that level. TIME: An NFL play often looks disorganized from the moment the ball is snapped, but is it? What's happening behind what you see on Sundays, and what are implications for teaching? Brendan Daly: There is a great amount of precision within each individual's technique and role in the play. When you put 22 of them out there, it can look chaotic but when you break down individual performance, it looks less so. Their footwork, technique, assignment, alignment and reaction are very precise. A great deal of it is mental, the ability to learn within the game, to perform at a high level  often with injury  and to weather the ups and downs of an emotional game through a 16-game season. Also, there is the willingness to prepare in the offseason, the film room, to learn the scheme and execute without a lot of repetition  that's football character. Tim Daly: In the best situations, where you have practitioners who are truly outstanding, they do many of the same things. They are very good at assessing what is working and what is not working. It's all deeply based in technique, but it's how you apply it in new or changing situations that matters. It's the ability not to just try stuff but to know the appropriate strategy. You don't just try a different pass rush every time until it works. The best administrators and teachers understand this. In the worst situations in education, there is very little feedback and very little support. You can go years without anyone telling you you're not doing well. TIME: There is a lot of debate about seniority in education, but seniority exists one way or another in every field. How does it manifest itself in the NFL? Brendan Daly: After several years in the league, when a player becomes a vested veteran in the NFL, they play under a different set of rules. For instance, if you cut a vested veteran mid-season and they don't get picked up by another team, you owe them the remainder of their salary. Veterans get priority in the training room and better parking, but there is not a whole lot of difference in terms of how they're treated in the competition for playing time. To me it doesn't matter if a guy is a 10-year veteran or a rookie. If the rookie is better, he finds his way onto the field. Tim Daly: What Brendan is describing is real distinctions based on performance. We don't do that in education. Everyone gets positive evaluations. And you don't get anything for being excellent. You don't get more money, more say in various decisions, or more choice over where you teach. Instead, everything is based almost entirely on seniority alone. TIME: In education, there is a raging debate about whether classroom experience and other credentials matter when it comes to being a good school leader. Brendan, you played tight end in college but didn't play in the NFL. Does that affect how you relate with players? Brendan Daly: I didn't play in the NFL, and I didn't play defensive line. But football, at the fundamental level, is football. It's about motivating people and getting the best out of them. Once you've proved to [the players] that you can help them become better players, you've earned their respect. They respect if you've achieved at a high level in this league, but that's not what they respect you for as a coach. I learned through apprenticeship. I was an assistant to a defensive coach, and I'm still learning. The best coaches I've been around, even older guys, are continually learning new ways to do things and new ways to teach. Tim Daly: [Some in education] say you can only teach or evaluate a subject if you majored in it. We paper over that most teachers teach multiple things. If you're a social studies teacher, you're also teaching literacy. In football there is a deep enough understanding of technique [to know] that it's transferable.